The Indian retail industry has witnessed a drastic revolution during the past few years. This can be attributed to the entry of large number of international players in the market. To compete with them, retailers in India have also upgraded themselves to offer a world class shopping experience to the Indian consumer. Also, retailers today are experimenting with various retail formats to provide comfortable shopping environment and keep the foot fall constant. Before doing in-depth analyses of retail formats available in India, it is crucial to understand the significance of an appropriate retail format. Location: The kind of merchandise that the retailer intends on making available to his consumer should be in accordance with the area in which he plans his retail outlet. Product: A large quotient of a retailer’s format proving successful depends on how well his merchandise goes with the specifications of a format. The product needs to ‘fit-in’ well with format being considered by the retailer. Having understood the various factors, a retailer can explore the opportunity of opening a retail outlet based on various retail formats. Mom and pop stores: These stores are favoured by the customers as they provide an easy access to products of daily necessity. During the time of big shopping malls, these neighborhood stores have all the potential of surviving the competition. These stores work best in smaller localities. Category killer: It is a small specialty store that offers huge variety in a specific product category and that too at low prices. Also known as big-box retailing, such stores offer less variety but a large assortment of merchandise, in a sense ‘killing’ a particular category from other retailers, hence the name, category killer. In India, Mega-Mart is one such category killer. Specialty stores: The retailers can develop a deep bond with the consumers as these stores focus on specific segments of the consumers. The brightest examples are Pantaloons which provides fashion solutions, Planet Sports dealing with sportswear, Raymond stores for fabrics, apparels and accessories. The specialty of Food Bazaar goes a step ahead from being a grocery retailer it also provides services like ‘Live Chakki’ where the customers can get fresh wheat ground after buying it. Supermarket: It is large in size and has a wide range of food and non-food items like fruits and vegetables, personal care, home care, household care products, general merchandise, dairy products, pharmacy products, mobiles, clothing etc. 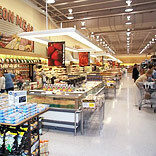 The best location for a supermarket is one that is close to a residential area and has enough space to provide parking. A popular supermarket is Aditya Birla Group’s ‘More’ store. Hypermarket: This format needs large space for its operations as it has huge volumes of stocks. It is a good shopping destination for the customers who need to pick up their weekly/monthly quota of groceries and general merchandise in one go. Here the retailers can reach out to a wide base of customers including the higher and lower income groups as it provides many products at reasonable prices. The most successful example in this format category is ‘Big Bazaar’. Shopping malls: The latest edition to the list of retail formats available in India are shopping malls. Malls offer a one-stop shopping destination. It combines shopping with entertainment and eating out. Kiosks: Finding increasing popularity are retail kiosks, small set-ups or booths either by retail brands or by private players. A small investment and minimal labour cost has paved the way for the success of kiosks, which are easy to manage and have low rentals and work well in shopping malls. Internet retailing: With this format the retailers can tap into even wider percentage of consumers. Here the retailer provides the consumers with the luxury of checking out the products and buying them online. But the retailer has to have a very appealing and authentic online display of merchandise so that the consumer has the feeling of visiting a real life store. A very good example is Future Group’s shopping portal – ‘e-tailing’. Rural retail stores: The rural areas also provide a good opportunity to the retailers. Here the retail stores have to cater to the specific requirements of the rural population. ITC is doing well in rural retailing through rural shopping mall ‘Choupal Sagar’ offering a diverse product range from FMCG to electronic appliances to automobiles, attempting to provide farmers a one-stop destination for all of their needs. Now all you aspiring and existing retailers who are planning to come up with fresh retail outlets, the above article must have lessened your doubts about which retail format is best suited to your requirement .Also, it would be apt to conclude that there is no one format that is said to be the most viable one. Rather it all depends on ‘from where (location), with what (product) and for whom (consumer)’ do you want to operate.